How Much Sunlight Does a Ficus Tree Need? Ficus trees prefer bright light and thrive near a sunny window. They will grow in medium light, but growth will be inhibited. Water your ficus tree well before and during a freeze to maintain soil moisture. Bring ficus trees grown in containers indoors during freezing temperatures and leave near a warm, sunny window until warmer weather returns. Drape incandescent Christmas lights around the branches of outdoor ficus trees. Plug the lights into an outdoor extension cord to provide heat from the lights for the plant. 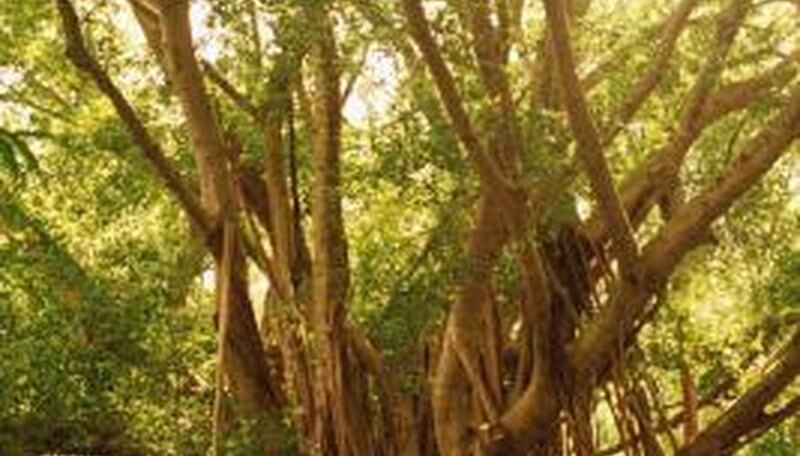 Wrap a blanket around the trunk of the ficus tree, securing it by wrapping wide rope around the tree and blanket. Lay a plastic tarp over the entire tree to create a mini-greenhouse, and attach to the ground by inserting a stake through each of the four corners of the tarp. Wait until temperatures reach above 40 degrees Fahrenheit before pruning off any dead or frozen limbs from your ficus. Pour growing medium into the individual seed pots or seed flat. Use a growing medium that has good aeration and holds moisture well. Any good quality medium with good drainage will do, but choose a mix formulated for germinating seeds, if possible. Fill the container to within 1 inch of the rim. Place one seed in each individual pot or set the seeds in rows in the seed tray. Use fresh seeds, if you can get them, to ensure success. Cover the seeds with 1/4 inch of growing medium and use the mister to moisten the growing medium without disturbing the seeds. Place the seeds in a warm spot and keep the growing medium moist until the seeds germinate. Make sure the temperature around the seeds goes no lower than 68 degrees Fahrenheit. Be patient, because germination may take up to several months. Keep the seedlings out of direct sunlight until they are more than 4 inches tall and ready to transplant into their own containers or into the garden. Give the seedlings a feeding every month or two, depending on how healthy they seem. Use a balanced, all-purpose fertilizer or houseplant food. Liquid fertilizer at one-quarter to half strength added to the plant's regular water is convenient and easy to remember. Look at an existing ficus tree and locate a woody stem---rather than a green, flexible stem---that has at least two sets of leaves. Cut the stem approximately 4 inches from the tip using hand pruners. Fill a plant pot with sand and add water it until it is completely moist. If desired, you may use perlite or vermiculite instead of sand. Poke a 1-inch deep hole in the center of the sand using your finger. Open a bottle of rooting hormone powder and dip the cut end of the ficus stem into it. Insert the cut end of the ficus stem into the hole and push the sand up against it to fill in the hole. If any of leaves are touching the sand, pull them off with your fingers. Place an upside-down plastic storage bag over the cutting and pull it all the way down. Place the pot in a location that receives indirect sunlight, such as near a window. Check the bag once per week and add additional water if the sand starts to feel dry. Prune to encourage a single central leader, the branch that sticks up vertically, during the tree's first or second year. Choose the strongest central branch and prune off the others. Cut off any dead, damaged or diseased branches at the base of the fig tree. Prune under the canopy of the ficus lyrata to keep the trunk clear. Remove any water sprouts or suckers that grow from the trunk. Prune the branches so that people can walk under the canopy of the tree if it is grown outdoors. Remove any crossing branches and any over-reaching branches. Thin out the branches of the ficus lyrata by about 20 to 30 percent if it is growing too bushy. Calculate the manufacturer-recommended amount of water-soluble fertilizer for a houseplant of your ficus's size and reduce the amount by half. Mix the fertilizer with the amount of water you usually give your ficus and pour it evenly over the soil. Repeat steps 1 and 2 once every three to four weeks while your ficus plant is actively growing and producing new leaves. Reduce the frequency of fertilization if your ficus's growth slows down in fall and stops in winter. Fertilize it only once, when fall begins, and stop fertilizing altogether during the winter. However, if your ficus continues to produce growth throughout the year, continue to fertilize it monthly. Insert a finger or wooden dowel into the ficus exotica's soil to test the moisture level. Check the soil moisture daily to assess the ficus exotica's water needs. Check twice daily when temperatures rise and the ficus uses more water. Water the ficus whenever the top 1/3 of the pot's soil is dry--not before. Use a watering can to water gently until water comes out of the drainage holes in its pot. If water pools at the surface of the soil, you are watering too fast. Stop watering, wait for it to absorb and start again with a slower stream. Empty the watering tray beneath the pot after the water has been allowed to drain for 30 minutes. Otherwise, the water will re-absorb and the ficus' roots will be sitting in water. Feel the top 2 inches of the soil with your finger before watering ficus every time. This will help ensure you do not over water the ficus (the leaves turn brown when this happens). The top couple inches of the soil must be completely dry. Mist the leaves of the ficus tree twice a day, once in the morning and again in the late afternoon. This helps provide humidity for the ficus. Use a tray with a thin layer of gravel, and fill it with water to provide the humidity if you do not want to mist the leaves every day. 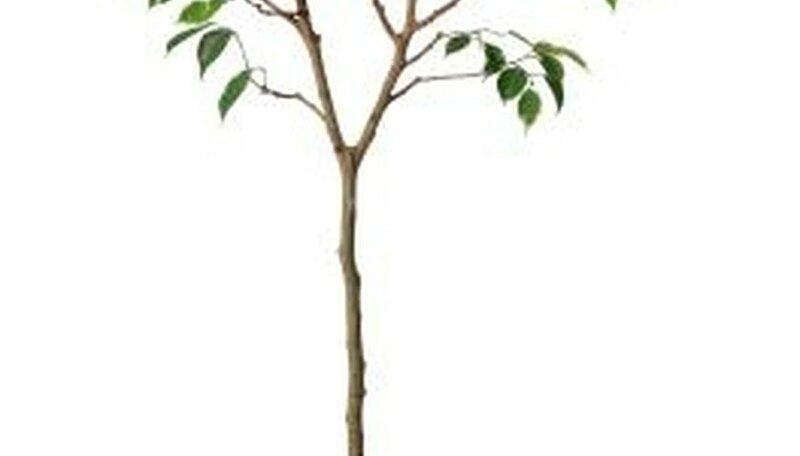 Reduce watering the ficus tree if you notice the leaves turn a yellowish color. This means that the tree has had enough water for the time being. Ficus elastica have green, glossy evergreen leaves that range from 5 to 12 inches in length and are oval in shape. Leaves have a course texture and the canopy of the tree is dense and thick. Ficus elastica leaves do not change colors in the fall months. Considered a fast growing tree, it often reaches heights of over 100 feet in its native habitat, but when grown in the landscape usually reaches 30 to 45 feet in height and 25 to 30 feet wide. 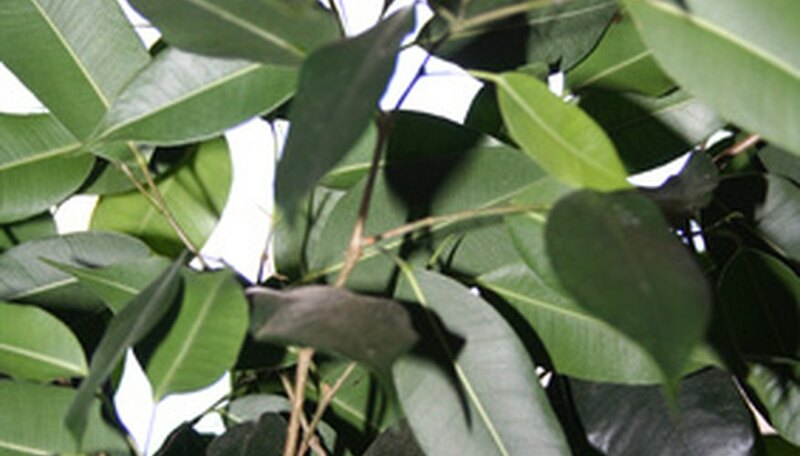 Preferring full sun or partial shade, Ficus elastica grows best in well-drained soil. When grown indoors in containers, it prefers medium light. This tree is drought tolerant and tolerates soil that remains wet for short periods of time. Ficus elastica is resistant to most damaging pests and diseases. Scale insects are occasionally a problem.